Should an EVA become necessary, it may bear close similarities to the three spacewalks performed by Doug Wheelock (pictured) and Tracy Caldwell-Dyson in August 2010 (Credits: NAS). The six-man Expedition 38 crew continued with a full plate of work aboard the International Space Station (ISS) Thursday, despite yesterday’s malfunction of one of two external ammonia coolant loops. The pump module on one of the loops automatically shut down when it reached pre-set temperature limits. According to a NASA update, the flight control teams are currently working to get the loop back up and running, with suspicion centering on the improper functionality of a regulating flow control valve inside the pump module as one possible root cause. Speaking earlier today, ISS Mission Operations Integration Manager Kenny Todd explained that investigatory work will continue through the weekend, but did not rule out a potential EVA to replace the pump module. 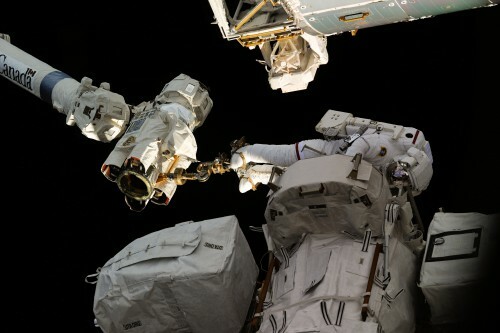 The International Space Station (ISS) is currently staffed by the Expedition 38 crew. In command is Oleg Kotov (seated right). 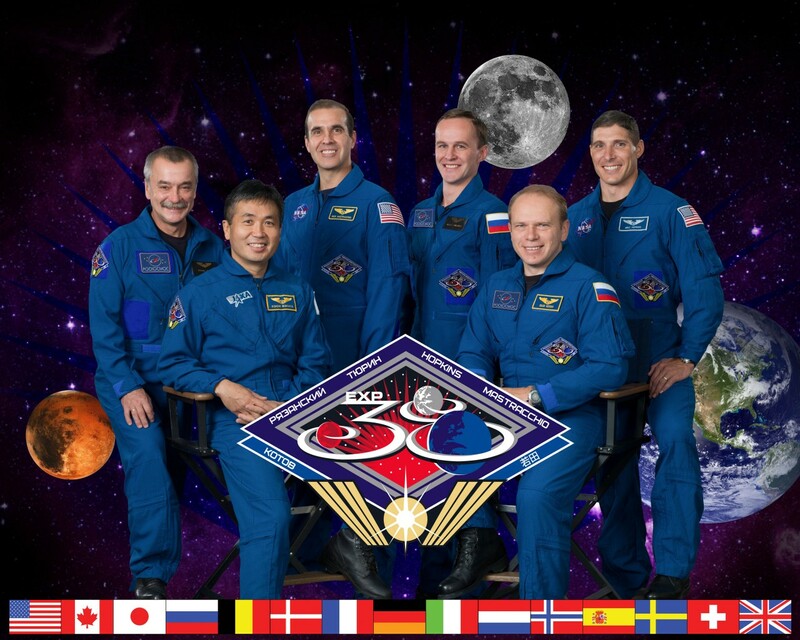 Seated left is Koichi Wakata, with (from left) Mikhail Tyurin, Rick Mastracchio, Sergei Ryazansky and Mike Hopkins standing (Credits: NASA). By regulating the temperature of ammonia in the coolant loop, the flow control valve ensures that when it is re-introduced into the heat exchanger of the station’s Harmony node, it does not freeze the water also passing through the exchanger. NASA has stressed that the Expedition 38 crew—which consists of Russian cosmonauts Oleg Kotov, Sergei Ryazansky and Mikhail Tyurin, U.S. astronauts Mike Hopkins and Rick Mastracchio and Japan’s Koichi Wakata—are in no danger, but added that teams did work to move certain critical station systems over the second coolant loop. Some non-critical elements have been powered down inside Harmony, as well as Japan’s Kibo and Europe’s Columbus laboratory modules, until such time as the problem is resolved. Todd added that the available “window” to launch ORB-1 might stretch out to 21 or even 22 December and explained that there was “no harm” in extending the Go-No Go decision to launch the mission. On its ORB-1 updates page, Orbital announced today that it is “awaiting word from NASA on whether there will be a schedule impact” and that “We expect to receive direction from NASA on how to proceed no later than Monday, 16 December”. Following the highly successful ORB-D mission, which concluded in October, Orbital Sciences Corp. plans to launch its first dedicated mission (ORB-1) on 18 December, although the current cooling loop problems have cast doubt on that schedule (Credits: NASA). For now, the ISS is described as being in a stable configuration and the six-man crew is safe and supported a full day Thursday of science and maintenance work. “The science and research mission continues aboard the station,” a NASA release explained, “and the science data collected so far is not at risk.” Mike Hopkins—who has been aboard the station with Kotov and Ryazansky since 25 September—spent time on the advanced Resistive Exercise Device (aRED) and worked in the Quest airlock to install a jumper for contingency power to the secondary shell heaters and prepared the U.S. space suits for some scheduled upcoming maintenance. Meanwhile, Rick Mastracchio deployed eight bubble detectors for the RaDI-N neutral radiation experiment and Koichi Wakata removed and stowed a NanoRacks platform. Both Mastracchio and Wakata arrived at the ISS with Mikhail Tyurin on 7 November. Elsewhere, on the station’s Russian segment, Oleg Kotov, who commands Expedition 38, focused on the unloading of the Progress M-21M cargo ship, which arrived at the ISS late last month, whilst his crewmates Tyurin and Sergei Ryazansky worked on maintenance and replacement of life-support equipment in the Zvezda module. Yesterday (Wednesday), Progress M-21M also executed its first of two planned “re-boost” maneuvers to increase the station’s orbit and establish the proper phasing and trajectory for visiting Russian vehicles in 2014. 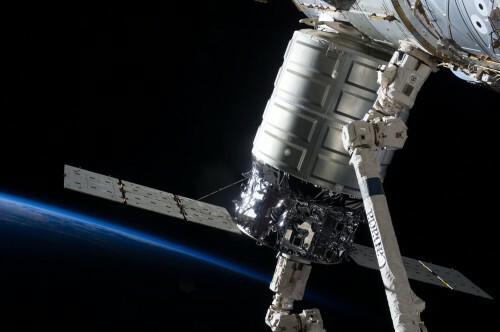 The Progress’ engines were fired for 7 minutes and 41 seconds and established the ISS in the optimum position for Orbital Sciences’ ORB-1 Cygnus craft, whose target 18 December launch should bring it for a rendezvous and berthing at the “nadir” (or Earth-facing) port of the Harmony node on 21 December.